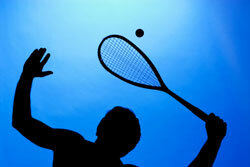 In these two action–packed presentations, Dr Marc Dussault a self–made multi–millionaire business and Internet entrepreneur and squash fanatic reveals the tips, tricks and techniques that catapulted him from a 38–year old first–time novice to a ‘top 50’ world ranking in Masters Squash in less than 7 years. Elite Athlete who wants the ‘edge’ over your competitors. Dr Dussault can outplay competitors who have been playing for 30 years even though he only picked up squash in his late 30’s. That is an edge that every elite or competitive athlete wants to have – you’ll discover what that edge is for YOU with this presentation. This is a fun, engaging session; it is not a ‘canned speech’, rather a personal revelation of strategies that will help you out–perform your opponents with minimal effort. As Australia’s #1 Exponential Growth Strategist, Dr Dussault is an accomplished and polished professional speaker. During this session, he preferred to keep the conversation light and filled with anecdotes and stories that will captivate your attention and expand your belief in what you’re capable of. How To Uncover Your Success Clues: Practicing for the sake of it is not effective if you are a committed athlete. A handful of strategies will be revealed to enable you to 'coach yourself' and/or help others assist you in the quest to improve as quickly as possible. Leveraging What You Don't Know You Know: Every competitive athlete knows what it feels like to be 'in the zone'. This single technique will enable you to recognise what you do whilst in the zone so you can get back into it 'on command'. Competition Preparation: Make sure you absolutely 'peak' at the right time, with the winner's mindset as well as re-create your success combinations and triggers. Secrets Strategies To Get The Edge: All elite athletes have secret strategies, tricks and tips that give them an edge. I will share some of mine with you as well as give you a template to keep acquiring them on an automated basis. 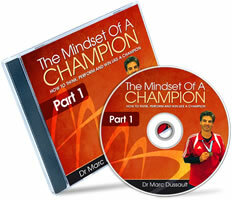 The audio DOWNLOAD of the Mindset Of A Champion: A live presentation, recorded at Geelong's Gym on Saturday 31 January. The full word-for-word transcript PDF of the Mindset of A Champion Presentation so you can read and re-read it to make sure you start to apply the principles and strategies in your training and competition. The audio DOWNLOAD of the Mindset Of A Champion: Peak Performance Strategies For the Elite and Mature Sport Athlete, recorded LIVE at Geelong’s Gym on Friday 27 Feb 2009. The full word-for-word transcript PDF of the Mindset of A Champion Presentation: Peak Performance Strategies For the Elite and Mature Sport Athlete so you can focus on the listening to the presentation and not worry about taking notes. In the first presentation, one person took 4 full pages of notes! If you have any pre-purchase questions that aren't answered on this website, email me at info [~at~] exponentialprograms . com . au and I will get back to you with an answer.